Have questions about Central Park? On occasion, we gather curious inquiries from Park lovers on our Instagram Story. 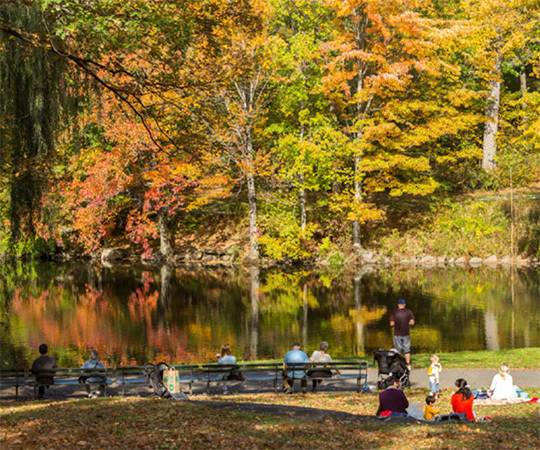 Read our responses below to some recent questions — on everything from the Park’s bridges and arches to when you can expect colorful fall foliage — then tell us what you’d like to know. Why are there so many bridges and arches in Central Park? Central Park’s many bridges and arches contribute to the Park’s innovative circulation system. Frederick Law Olmsted and Calvert Vaux, the Park’s designers, intended for roads and paths to accommodate pedestrians, horse-drawn carriages, and horseback riders. Bridges and arches helped to make a seamless and safe experience of movement throughout the Park. Most often, they carry one type of travel over another; they also provide walkways over water bodies. 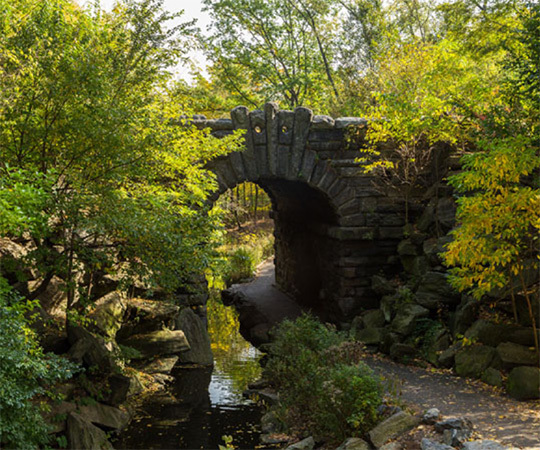 Glen Span Arch, which carries the West Drive above, is one of Central Park’s many bridges and arches that allow visitors to navigate the Park seamlessly above water bodies and other forms of travel. There are 31 arches and bridges in the Park, plus 14 bridges that carry Park traffic over the four transverse roads, allowing City traffic to cross the Park. This does not include the many rustic wood bridges found in the Park’s woodlands. Is it true that people can’t drive cars inside Central Park anymore? That’s true — as of this summer, all of Central Park’s drives are now permanently off limits to public vehicular traffic. (The transverse roads at 97th, 86th, 79th, and 65th Streets remain open to cars.) Only official cars essential to running and maintaining the Park will be allowed on the drives. 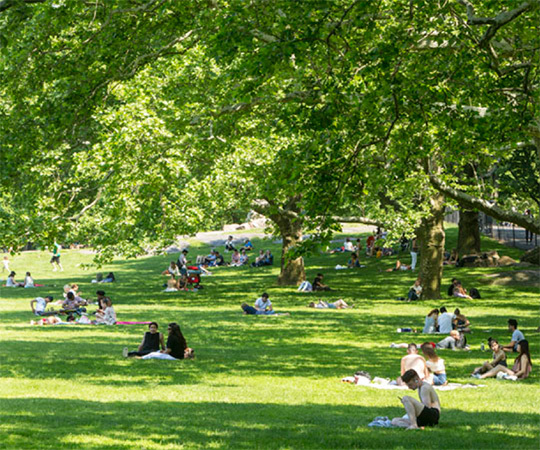 If you’re looking for ways to get moving in a car-free Central Park, see our recent blog post on ideas for being active in the Park this summer. How many people visit Central Park in a day? A lot! Central Park receives more than 42 million visits by more than 9 million people each year. Estimated daily visits range from approximately 44,000 on a weekday in winter to 242,000 on a summer Sunday. With more visitors than Yellowstone, the Grand Canyon, and Yosemite combined, Central Park has never been more popular than it is today. What month does fall foliage typically peak? Last year, peak colors arrived about early November — but it’s difficult to predict timing of fall foliage each year because it depends on rain, temperatures, wind, and more. To understand this, it’s important to consider how the leaves on Central Park’s trees react to autumn. Each fall, trees shut down their food-making process, called photosynthesis, and begin to store energy for the season ahead. Once a tree’s trunk has filled with the necessary moisture and sugar to survive the winter, chlorophyll — a bright green chemical — starts to break down. Leaves turn various shades of yellow, orange, red, and purple as the colors of other always-present chemicals come to the forefront. One of Central Park’s most iconic spots for admiring fall foliage is the Pool. Peak autumn colors arrived in early November last year, but it’s difficult to predict when they’ll arrive this year. While temperature and moisture play a big role on when this process happens, so does light. Trees detect the upcoming winter not only from colder temperatures, but by the angle at which the sun hits its leaves. Because Central Park’s trees are often obscured by shadows of surrounding buildings, they can have a distorted sense of the seasons. This often results in a later — though no less beautiful — foliage turn than other parts of New York. Once fall foliage reaches peak (follow @centralparknyc on social media!) be sure to visit the glorious colors at these landscapes. Is the fountain from Friends in Central Park? That’s a common misconception! Many people believe Cherry Hill Fountain is from the iconic opening sequence of the hit comedy series Friends, but alas it’s not. Though Friends was set in New York City, it was shot on-set in Los Angeles. The Friends opening was actually filmed on a Warner Brothers lot in Burbank, California. We still think the Victorian fountain in Central Park, designed by Jacob Wrey Mould as a watering trough for horses, is still worth a visit. 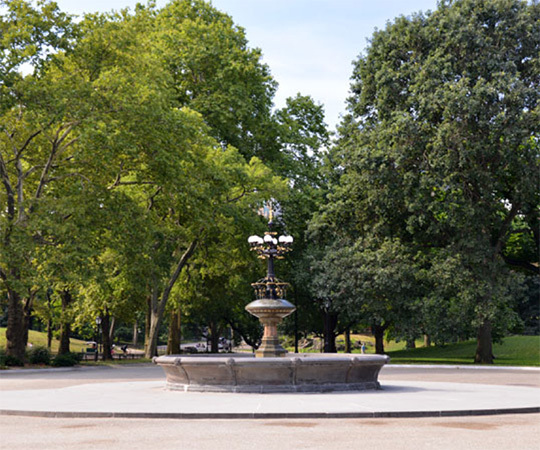 Cherry Hill Fountain, designed by Jacob Wrey Mould and a short walk from Bethesda Terrace, is often mistaken for the fountain in the opening sequence of the TV show Friends. Have a question? Message us on Facebook or Instagram — your question may show up in a future blog post.